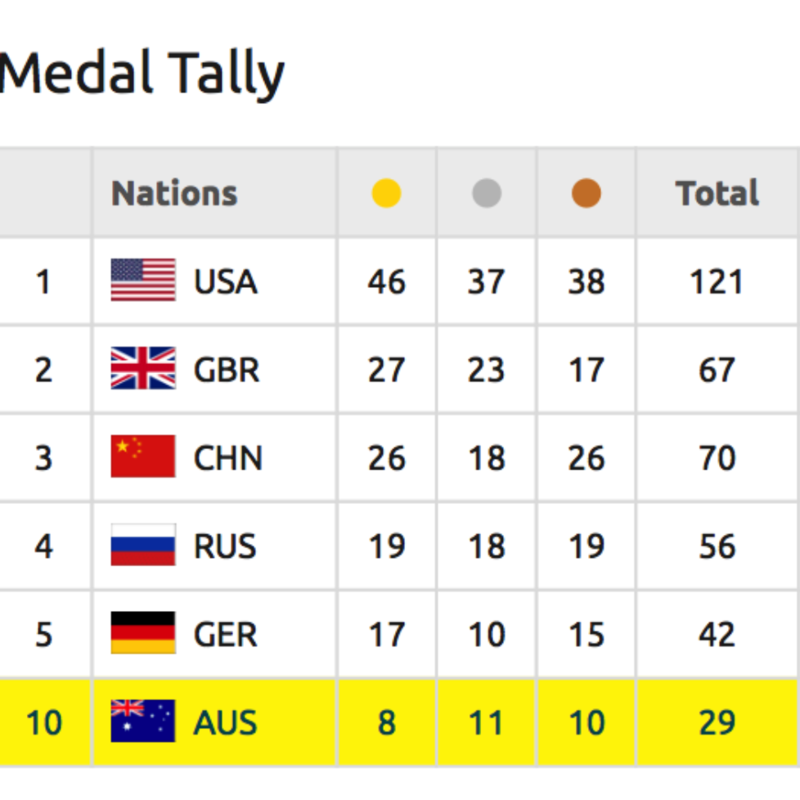 I’ve watched, with anger, the criticism of Australia’s Olympic athletes over the last two weeks. Many in the Australian public and the media have criticised Australia’s premier athletes. The criticism occurred while the athletes were still in Rio and, even more, upon their return to Australian soil. Kitty Chiller, 2016 Chief de Mission, spoke eloquently each and every day from Rio about the pride she had for the athletes, whether they won or lost, and held off the daily criticism of her team. Chiller was a class act at each and every press conference. Chiller became not just Chief de Mission, but cheerleader in chief. Imagine the job she had to do in front of the athletes each and every day in this age of social media. 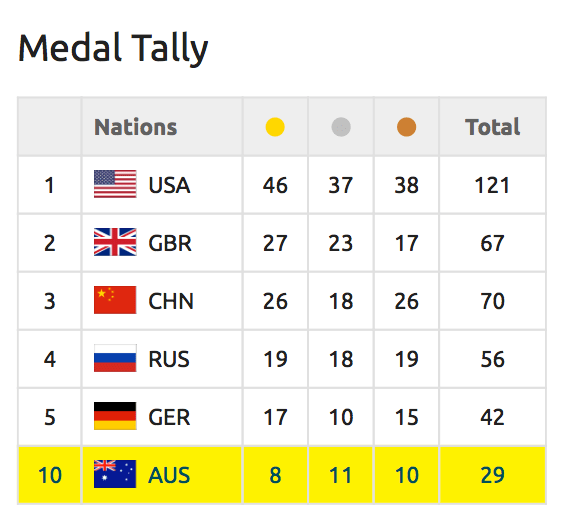 The barrage of criticism about Australia coming in tenth in the medal count has been sickening to watch and mind boggling to try to understand. How many Olympic medals do you have in your home? Last time I checked, I had zero. I would guess the same is true for every single person reading this blog post. So, who are we to criticise these young people who worked day in and day out to make the Olympic team and to compete on the world stage with the world’s finest athletes? Further, who are we to criticise any of them for coming home with less than Gold or no medal at all. It is sad to see the conversation occurring in the public forum, including the airport hanger when the Qantas jet arrived from Rio. Imagine how this must have made the athletes feel knowing they were under such scrutiny despite having worked their hardest to make their country proud. The conversation has been all about the funding of the “elite athletes” and whether Australians received their money’s worth. The discussion became about ROI and a debate about how Australian’s athletes should be funded in the future. The Australian Olympic Committee is a non-profit organisation. Like any non-profit in our country, the committee should raise money from the private sector. Like the US and other countries, money should be raised from individuals and from corporations to fund training programs, training centres, and sending the athletes to compete in various games. I also believe a lottery must be created for mass participation. Investing in these athletes, just as we invest in the mission of any non-profit organisation, is a choice we can make to demonstrate our national pride. First, the AOC must invest in talented fundraisers to generate the necessary funding. Charity staff need to treat passwords like gold. Some do not. I visit, on average, three clients a week. 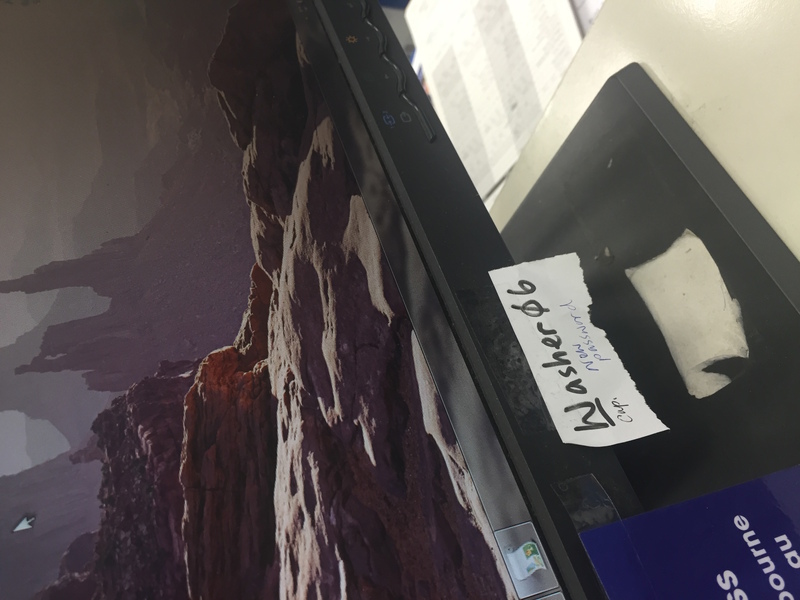 I see passwords displayed on monitors, posted in workstations, and in other public forums most weeks. It is shocking. In some meetings, I hear things like “just use my login/password”. Instead of the person logging in for their colleague, they will share their password across the room. It is as bad as sharing your credit card number on a telephone call in the middle of an airport. This is not true of all clients. Some are model examples of security. But, it is certainly enough of an issue for me to write a blog post about the risk. A non profit organisation’s CRM is the organisation’s number one asset. 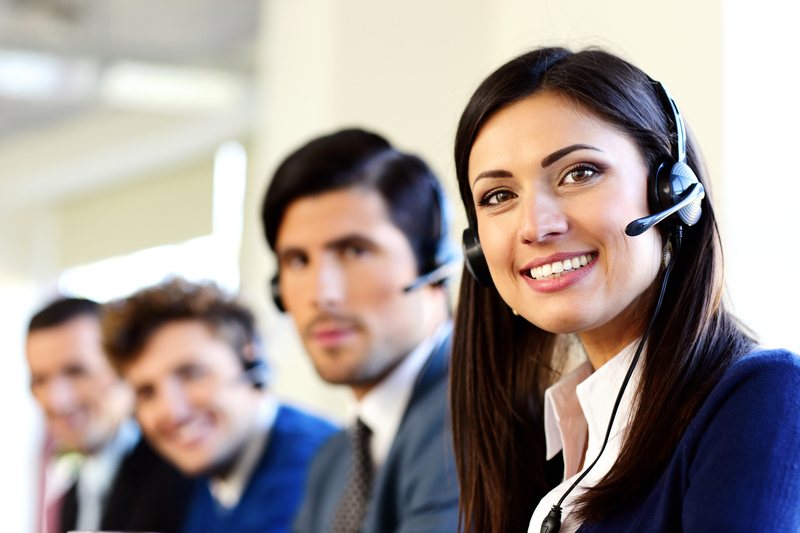 As staff, you hold the keys to the CRM through your login credentials. Don’t put the CRM at risk by displaying your password on your computer’s monitor or in another public forum. Who does donor care well? University of Queensland. Again. Recently, I wrote a blog post about the great call I had from University of Queensland (UQ). I often highlight UQ in my blog because the UQ Advancement Office follows best practice. But, this call was exceptional. On this particular call, UQ hit all the right points – an expression of appreciation of my financial support; confirmation of my contact details; a request for renewed support; and, a follow up donor care video to thank me for my renewed support. 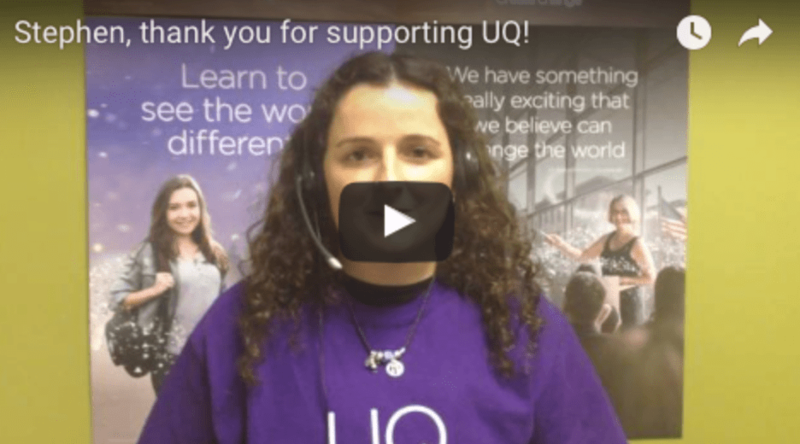 UQ sent a personal thank you video a week later as an expression of their gratitude. This video included the actual caller expressing gratitude for my contribution. Every one of us should implement this strategy today! It’s inexpensive, fast, and links the donor direct to the caller. Record a quick thank you message from the person who called the donor, or from a client, or staff person. This highly personal approach is something we can all employ from the field. The 2016 GiveEasy Innovation Index has been released. 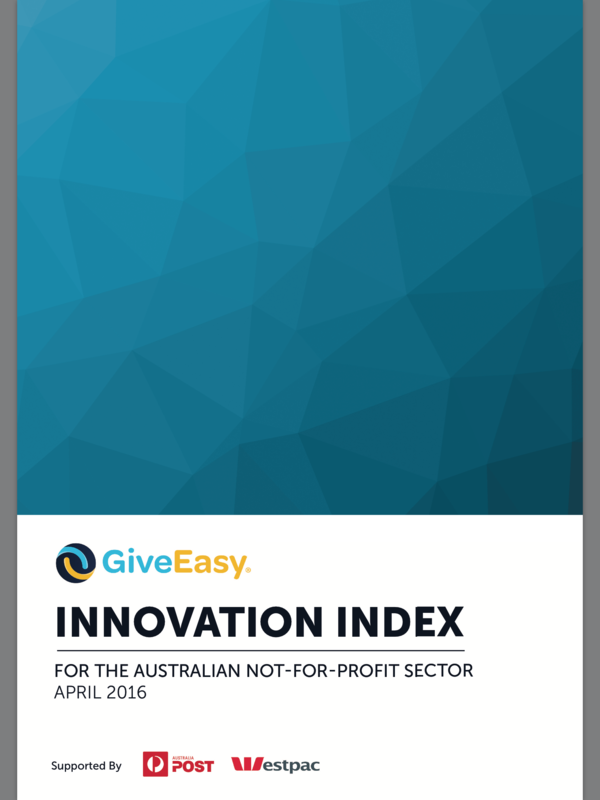 Reviewing the Innovation Index, it is striking how far Australian charities have to go in terms of innovation. Jeremy Tobias, CEO of GiveEasy, does report there are some “promising signs”. Further, the Innovation Index shows a correlation between innovation and growing budgets. Tobias suggests this mirrors our for-profit counterparts (and other similar studies in the corporate sector) where innovation leads to greater share price and revenue growth. The Innovation Index illustrates a non profit sector, which “remains largely middle of the road” when it comes to innovation performance. Just 37%, according to the study, of respondents have an agreed innovation strategy or innovation focus in their non profit organisation. GiveEasy suggests “this implies fairly low levels of committed, structured internal resources for innovation”. Not all bad news, GiveEasy reports some signs of improvement in some key areas: those who are actively pursuing innovation do score higher and are more likely to have increasing budgets; funding and grants are more likely to be awarded to more innovative non profits. Additionally, the study had a greater number of participants this year than in the past. Perhaps your organisation ticks one of these boxes? Lack of money to innovate. Lack of time to dedicate to thinking outside the box. Burdened by government reporting and compliance. Lack digital capabilities in house. Do not use social media or other online sources of marketing and fundraising. Experience low levels of support for innovation. If so, you appear to not be alone. GiveEasy suggests a dedicated, collaborative effort is required from sector stakeholders if we want a flourishing NFP secret that can meet the evolving demands of the digital area. The Innovation Index offers seven capabilities which need to be embraced and implemented. Download a copy of the GiveEasy Innovation Index today. Learn from it. Study it. Begin planning your innovation strategy now. Is there careful oversight of the data in your CRM? A majority of the staff in today’s non-profit organisation believe the data somehow magically gets cleansed, de-duplicated, and managed day in and day out. The view is the data is on “auto pilot”. Staffs of non-profit organisations worry more about what is about to go off in the refrigerator than they worry about the data in the organisation’s CRM. It is sort of like the dishes in your kitchen. They do not magically get hand washed or placed in the dishwasher. Confirm the details in the record are correct, clean and accurate – name, address, telephone number(s). Edit anything erroneous in the record – change of address, misspelling of a name, etc. Enhance anything missing – mobile telephone number, email address, etc. When you end the communications with the constituent, it is too late to confirm, edit or enhance. In addition to this day to day activity, NFPs must cleanse their data at least one time per year to obtain changes of address, deceased and opt out flags. The data hygiene process is often referred to, by some data managers, as more painful than a root canal. It does not have to be. Hire a professional to manage the process for your NFP the first time. Document the process and then you or someone on your team will manage the process moving forward. Data management is managed by one, but best handled by an army. Everyone owns the data in your organisation. NFPs invest heavily to acquire donors. This is an expensive process. It will cost you to manage your data. But, it is even more expensive to lose a donor.